What Is the Difference Between Blue & Red Litmus Paper? Litmus paper is a pass or fail type of test that determines if a substance is acidic or basic whereas pH strips determine the pH value. Chemicals and solutions are often classified as being acidic, basic or neutral. These properties are determined by the pH scale, which ranges from 0 to 14. Low pH values are considered acidic, high values are called basic and values around 7 are neutral. People need to measure the pH because it affects most life forms, for example, a slight change in the soil’s pH can kill entire crops; minimum alterations in the pH of the human body can cause health problems. To measure the acidity or alkalinity of a liquid people use Litmus paper or pH strips. 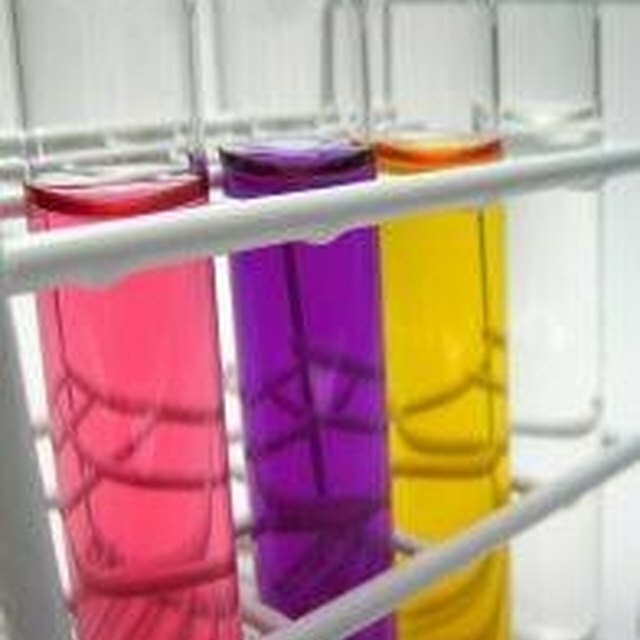 The pH strips determine the pH value whereas Litmus paper only indicates if the substance is acidic or basic (alkaline). How Does Litmus Paper Work? Both Litmus paper and pH strips are small strips of paper coated with a chemical substance that will undergo a reaction when it comes in contact with the liquid being tested. Litmus paper comes in two colors: red or blue. Red Litmus paper turns blue if it comes in contact with a base, alternatively blue litmus paper turns red with acids. This is a pass or fail type of test that only works with acidic or basic liquids. Neutral solutions do not cause a change of color, although there are some brands of blue Litmus paper that will turn purple if the substance is neutral. How Do pH Strips Work? pH strips change color when they come in contact with a solution. The color must be compared with a chart to get a number and determine if the liquid is acidic, basic or neutral. For example, if you are testing a citrus juice, the color change would happen around the 1 or 2 pH level (acidic) whereas water would change color around 7 (neutral). pH strips are considered to be more sensitive than Litmus paper because Litmus paper cannot give quantitative results. The choice of which method is appropriate depends on the requirements or sensitivity needed for the test. Both pH strips and Litmus paper are fast, inexpensive and easy-to-use methods to measure the acidity or alkalinity of a substance, but it's worth noting that pH strips don’t determine the exact pH value. Only pH meters, instruments that measure the hydrogen-ion activity in a substance, can determine it. Malesky, Mallory. "What Are the Differences Between Litmus Paper & pH Strips?" Sciencing, https://sciencing.com/differences-between-litmus-paper-ph-strips-13673.html. 29 April 2018.